Habermas - "Democracy, Solidarity, and the European Crisis"
"... I was so pleased to have the opportunity to meet you in my current capacity, last September. You came to me, with one main question – a crucial one. You had been following closely the political response to the crisis, regularly commenting on it, and you wanted to know: "Are European leaders aware that they face historic choices today?" This deep motif was bound to bring Europe on your path. For no country more than for your own, has Europe been such a source of redemption. A new beginning, a promise. For me also, it has been the most inspiring idea. Reconciliation and togetherness. From "us versus they" to "You and me". Ich und Du." Herman Van Rompuy is President of the European Council. "Democracy, Solidarity, and the European Crisis"
"....the German government holds the key to the fate of the European Union in its hand. If there is one government among the member states capable of taking the initiative to revise the treaties then it is the German government. [.....] In the wake of the shock of the defeat of 1945 and the moral catastrophe of the Holocaust, prudential reasons of regaining the international reputation destroyed by its own actions already made it imperative for the Federal Republic of Germany to promote an alliance with France and to pursue European unification. In addition, being embedded in a context of neighboring European countries under the hegemonic protection of the United States provided the context in which the German population at large could develop a liberal self-understanding for the first time. This arduous transformation of a political mentality, which in the old Federal Republic remained captive to fateful continuities for decades, can not be taken for granted. That shift in mindset occurred in tandem with a cautiously cooperative promotion of European unification. Moreover, the success of this policy was an important precondition for solving a more long-standing historical problem that I am concerned with in the first place. After the foundation of the German Empire in 1871, Germany assumed a fatal “semi-hegemonic status” in Europe — in Ludwig Dehios’s words, it was “too weak to dominate the continent, but too strong to bring itself into line”. It is in Germany's interest to avoid a revival of this dilemma that was overcome only thanks to European unification. This is why the European question, which has been intensified by the crisis, also involves a domestic political challenge for Germans. The leadership role that falls to Germany today for demographic and economic reasons is not only awakening historical ghosts all around us but also tempts us to choose a unilateral national course, or even to succumb to power fantasies of a “German Europe” instead of a “Germany in Europe”. We Germans should have learned from the catastrophes of the first half of the twentieth century that it is in our national interest to avoid permanently the dilemma of a semi-hegemonic status that can hardly held up without sliding into conflicts. Helmut Kohl’s achievement is not the reunification and the reestablishment of a certain national normality per se, but the fact that this happy event was coupled with the consistent promotion of a policy that binds Germany tightly into Europe." See also Herman Van Rompuy's introductory speech to Habermas. See a short video from the event here. And a video of Van Rompuy's introduction and Jürgen Habermas's lecture here. Richard J. Arneson has updated his entry on "Egalitarianism" in "Standford Encyclopedia of Philosophy". Richard J. Arneson is Professor of Philosophy at the University of California, San Diego. Does Deliberative Democracy Need Deliberative Democrats? "Many political theorists today appeal to, or assume the existence of, a political culture in which the public values of Western liberal democracies are embedded – a political culture that is necessary to render their ideas plausible and their proposals feasible. This article contrasts this approach with the more ambitious arguments advanced by Jürgen Habermas in his original account of discourse ethics – a moral theory to which, he supposed, all human beings were demonstrably and ineluctably bound by the communicative constitution of collective life. Although these arguments have been largely discredited, I argue that Habermas’ analysis can be enlisted in defence of a weaker claim: namely, that principled commitment to discussion is not always necessary for genuine deliberative engagement to occur. As a result, there may be hope for democratic deliberation in contexts where a liberal democratic political culture is lacking." See also three recent papers by Nick O'Donovan here. Wenn wir Kritik an unserer Gesellschaft üben wollen, auf welche Normen können wir uns stützen? Nur auf moralische Argumente, die wir von außen an sie herantragen? Eine Alternative zu "externen" Herangehensweisen bietet die Methode der "immanenten Kritik", die Normen mobilisiert, die bereits in einer Gesellschaft zu finden sind. Obwohl sich die Tradition der Kritischen Theorie dieser Kritikform verpflichtet fühlt, sind ihre Grundlagen bisher nie geklärt worden. Die Studie erläutert die Möglichkeit immanenter Kritik unter Rückgriff auf aktuelle Theorien kollektiven Handelns und sozialer Praktiken. 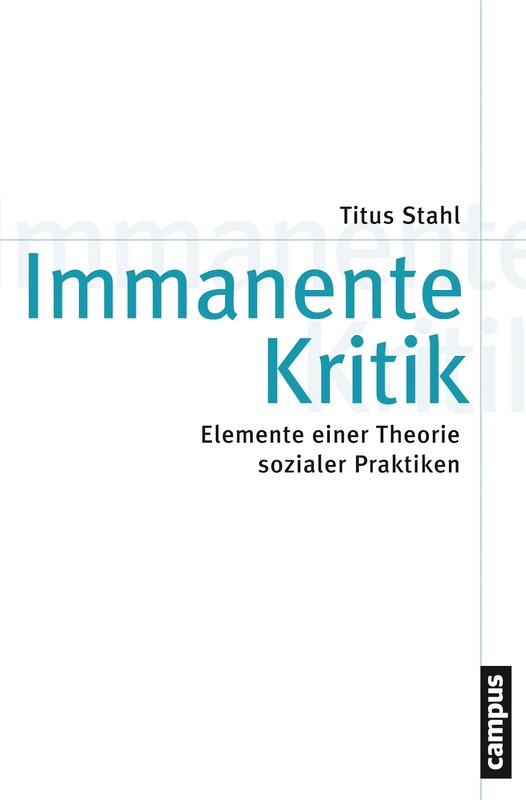 Titus Stahl entwickelt ein Modell der Kritik, das die Potenziale herausstellt, die in alltäglichen Formen wechselseitiger Anerkennung existieren. Titus Stahl, Dr. phil., ist akademischer Rat a.Z., Institut für Philosophie, Göethe Universität Frankfurt am Main. "Jürgen Habermas’s theory of ‘discourse ethics’ has been an important source of inspiration for theories of deliberative democracy and is typically contrasted with agonistic conceptions of democracy represented by theorists such as Chantal Mouffe. In this article I show that this contrast is overstated. By focusing on the different philosophical traditions that underpin Mouffe’s and Habermas’s respective approaches, commentators have generally overlooked the political similarities between these thinkers. I examine Habermas’s and Mouffe’s respective conceptions of democratic politics and argue that they cannot be so neatly distinguished from each other. I show that much of Mouffe’s criticism of Habermas’s theory does not hold up to careful scrutiny, and discourse ethics shares important points of similarity with her own democratic theory. By using critical republican theory to show the similarities in their work, I push beyond the agonistic versus deliberative debate, and show that at the heart of both of these approaches is a critical republican emphasis on the need for civic solidarity, on the constructive role of conflict in democratic politics and on the vital importance of self-government. These are crucial ingredients for the regeneration of democracy in contemporary pluralistic societies." Gulshan Khan is Lecturer at the School of Politics and International Relations, University of Nottingham. Van Parijs & Offe on "Social Justice in the European Union"
Philippe Van Parijs is Professor at the Université catholique de Louvain (UCL), Belgium. See Philippe Van Parijs's discussion with John Rawls on Rawls's "The Law of Peoples" here: "Three letters on The Law of Peoples and the European Union" [pdf]. 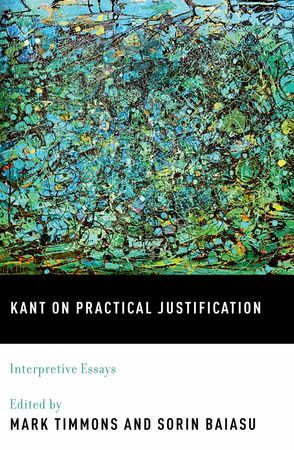 This volume of new essays provides a comprehensive and structured examination of Kantian accounts of practical justification. This examination serves as a starting point for a focused investigation of the Kantian approach to justification in practical disciplines (ethics, legal and political philosophy or philosophy of religion). The recent growth of literature on this subject is not surprising given that Kant's approach seems so promising: he claims to be able to justify unconditional normative claims without recourse to assumptions, views or doctrines, which are not in their turn justifiable. Within the context of modern pluralism, this is exactly what the field needs: an approach which can demonstrably show why certain normative claims are valid, and why the grounds of these claims are valid in their turn, and why the freedom to question them should not be stifled. Although this has been a growth area in philosophy, no systematic and sustained study of the topic of practical justification in Kantian philosophy has been undertaken so far. Several of the essays are based on papers presented at the UK Kant Society Annual Conference in 2007. Mark Timmons is Professor of Philosophy at the University of Arizona. He is the author of "Morality without Foundations" (Oxford University Press, 1999). Sorin Baiasu is Reader in Philosophy at Keele University. Professor John Tomasi will speak on his recent book "Free Market Fairness" at a meeting in Copenhagen April 9. He will also speak at an arrangement at the Faculty of Law, Copenhagen University. See here. See my post on John Tomasi and his book here (with links to lectures and book reviews). John Tomasi is a Professor of Political Science at Brown University. He is the author of "Liberalism Beyond Justice: Citizens, Society and the Boundaries of Political Theory" (Princeton University Press, 2001) and ""Free Market Fairness" (Princeton University Press, 2012). "Legitimacy, Democracy and Public Justification: Rawls’ Political Liberalism vs Gaus’ Justificatory Liberalism"
"Public justification-based accounts of liberal legitimacy rely on the idea that a polity’s basic structure should, in some sense, be acceptable to its citizens. In this paper I discuss the prospects of that approach through the lens of Gerald Gaus’ critique of John Rawls’ paradigmatic account of democratic public justification. I argue that Gaus does succeed in pointing out some significant problems for Rawls’ political liberalism; yet his alternative, justificatory liberalism, is not voluntaristic enough to satisfy the desiderata of a genuinely democratic theory of public justification. Moreover I contend that — pace Gaus — rather than simply amending political liberalism, the claims of justificatory liberalism cast serious doubts on the sustainability of the project of grounding liberal-democratic legitimacy through the idea of public justification." Enzo Rossi is Senior Research Fellow in Social Philosophy at the University of Wales, Newport. Axel Honneth will give three lectures in Beijing April 1-2, 2013. Honneth will also receive an honorary professor title at the Faculty of Philosophy, the Chinese Academy of Social Sciences. "Freiheit, Gerechtigkeit und Anerkennung: Axel Honneth in Beijing".